The Department of Environment and Natural Resources’ massive plan to rehabilitate the Manila Bay found thousands of supporters in different places sharing the same goal―to clean up the polluted waterway. MGB IV Calabarzon Mines Safety and Health Environment Social Development Division Chief Dondie Sarmiento (5th from left) leads the the laying of a trash-trap curtain at Antipolo-Angono River, then stands with Gil Castro, administrative manager of Gozon Devt. Corp.; Teofilo Salcedo, NGO Representative Rizal; Ariel Yson, Solid Cement Corp. community relations officer; Angelita Lee, VP Rapid City Realty & Dev. Corp.; and Luisa Noche, plant manager, Monte Rock and Development Corp. 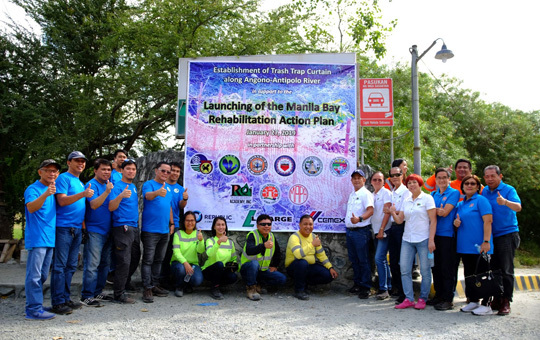 In full support of the program, officials and employees of Mines and Geosciences Bureau-IV in Calabarzon and members of the Eastern Rizal Miners Association and Rizal Quarry Academy Inc. trooped to Angono to put up a trash-trap curtain to address the source of rubbish that contributes to the pollution of Manila Bay. Spearheaded by the MGB, a bureau under the DENR, the 50-meter trash-trap curtain captures trash before it flows downstream. “Manila Bay pollutants come from different sources, and aside from the cleanup of its coastline, we believe it is crucial to directly fix the source of pollution, which are in various areas all over the country,” says MGB IV Calabarzon Regional Director Samuel Paragas. The trash trap is just one of the many ways to capture wastes from the source, and the one at the Antipolo-Angono River is a pilot program for MGB Calabarzon. “The success of our Manila Bay rehabilitation program, as well as all other policies and measures with regard to waste management, remains in the firm resolve of each of us to truly clean up and live up to having a clean environment,” Paragas added. The Manila Bay Rehabilitation program was approved by President Rodrigo Duterte with an allocated budget of P42.95 billion that will include cleanup activities, relocation of illegal settlers, and apprehension of establishments that violate the Philippine Clean Water Act and other environmental laws. Topics: Department of Environment and Natural Resources , Manila Bay , Eastern Rizal Miners Association , Rizal Quarry Academy Inc.